This is the 3rd member of the Tagiades species in the series. 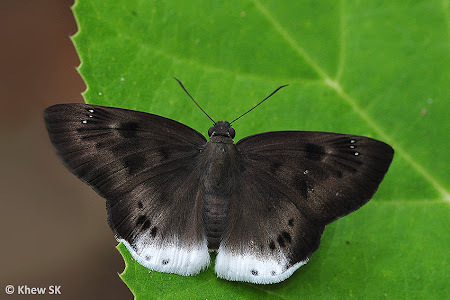 Compare the white tornal area on the hindwing and the spots with the Malayan Snow Flat and the Ultra Snow Flat and you will be able to see the differences between the three. The Large Snow Flat is more often encountered than its two other cousins mentioned above. It displays the same habit of hiding on the undersides of leaves with its wings opened flat. The Large Snow Flat is dark brown above with diffuse discal and post-discal spots. The tornal area of the hindwing above is whitened and has small and diffused black spots at the marginal area. The whitened area is more extensive on the underside.